Montbell really pulled out the stops on this one. They created a fully featured 1000 fill down jacket that weighs only 8.4 oz! We have been testing their EX Light Down Anorak (6.2 oz), which is an essential summer piece, but it’s warmth is limited and we really missed having pockets. 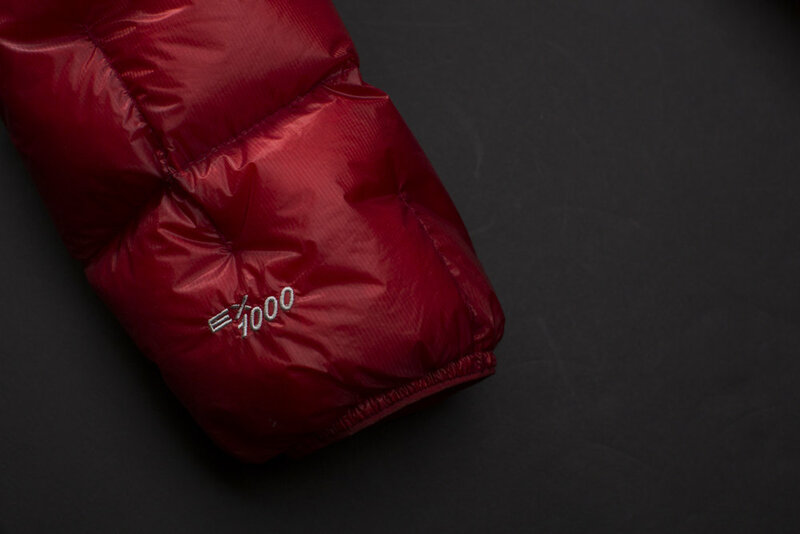 Enter the 1000 Alpine Parka. With the greater fill power, this is a piece that can extend further into winter. Obviously with the higher fill power, it doesn’t pack down as small as the Anorak, but with the added features and warmth its well worth the slightly larger package. The only negative is that the shell fabric is a bit delicate, but that comes with the territory on these UL layers. A truly awesome parka from Montbell! 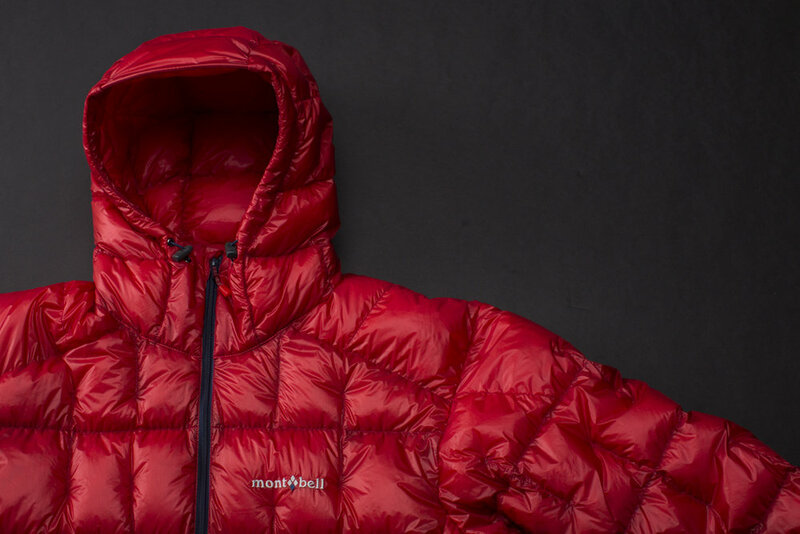 “The world’s lightest full-featured hooded down jacket. ” I can’t argue with that. This is a great piece. It’s very warm for the weight. It’s extremely comfortable. I’ve heard reviews that fault the durability of the shell fabric, but when you’re making a sub-10 oz. puffer, you can’t use the heavyweight shell fabric. If you haven’t experienced Mountain Hardwear’s Q-shield down, it’s a revelation. We have their Phantom 32 sleeping bag and it’s been very condensation resistant while using a bivy. As you know, wet down is fairly useless, so MH has gone and treated the down so it’s moisture resistant. The Ghost Whisperer is an innovative piece of packable warmth. I had been looking for warm camp pants that were like sweats, but with a bit more function. These pants are exactly that. They have pant pockets and have (stretchy) reinforcement on the seat, which is great. The sizing is a bit snug, so if you want them to be like tights, stick with your normal sizing and consider sizing up if you want them a bit more relaxed. These are a very comfortable 8 oz. camp pant. The traditional pant styling lets you wear them to the store for a beer run without looking like you ran out in your jammies. Trim enough that they layer well under shell pants. I have a real love for the Ibex brand in general. They do great wool products, period. The quality always feels like it's from a previous generation where clothing was still made to last. 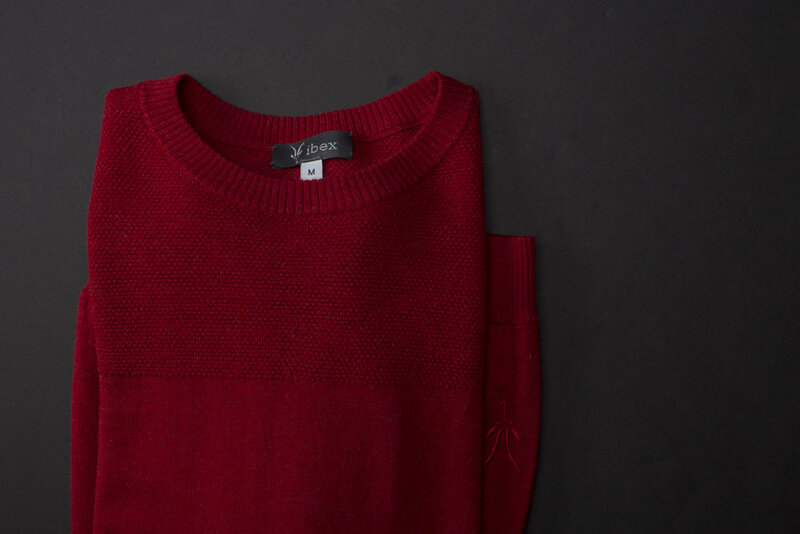 The carver sweater is no exception. The only negative, that’s actually a positive, is that this piece looks so refined that I hesitate to wear it out in the woods as a warm layer. I want to keep it nice for going out, but really it’s cut snug enough that you can wear it as an insulating layer, with the added bonus that it looks finished enough to wear it out to dinner. Let's just call it versatile. The Ibex woolies 1 is the workhorse baselayer piece. Our suggestion is to get one short sleeve top, one long sleeve top and the bottoms. For Oregon winter the Woolies 1 is plenty warm. If you live further North and get proper cold winter you may want to look at their heavier Woolies 2 or 3 weights. The merino wool quality is extremely high and the pieces are cut perfectly. 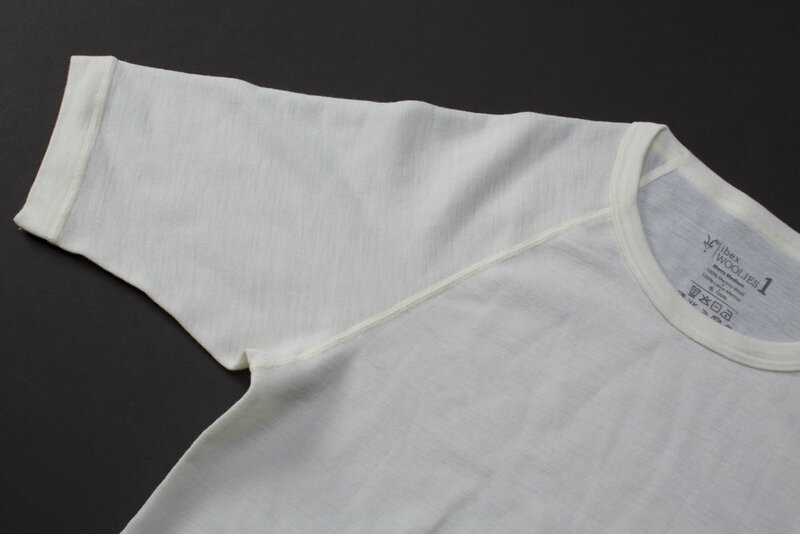 They look good enough and wear well enough that they’ll replace your cotton tees. The long sleeve under a shell jacket is the perfect combination for most PNW fall days. Truly essential pieces! 7Mesh don’t just dabble in designing clothing. They look at cut and material in a way that few brands do. 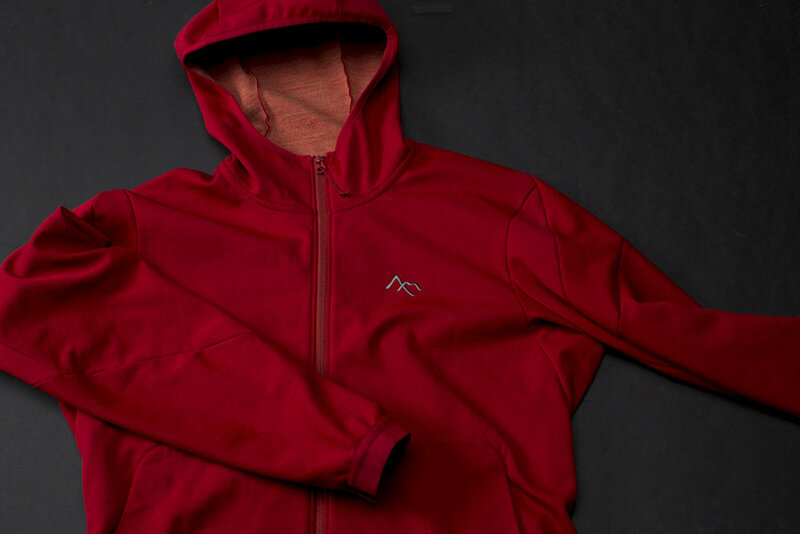 So when they offer a Merino hoodie, they layered the comfortable merino on the inside next to your skin, and the poly on the outside for durability and resistance. This has the added bonus of aiding in wicking and keeping the fabric looking finished and not pilling. The cut is designed around a riding position but is loose enough to fit and look good off the bike as well. We appreciate 7Mesh making versatile clothing that does double duty. I live in a wet climate and do my best to ride year-round. I personally hate soaking out my shorts. One excellent solution to this scenario is 7Mesh’s Gore-Tex Revo shorts. They’re a game changer. They really work! They work so well that I’ve taken to bringing them on road rides whenever there is a chance of downpours. The give me peace of mind and let me stay out as long as I please without feeling the need to run for home. The length is long enough to come to your knees, so you have good coverage, but don’t overheat the way you would with full-length shell pants. As with most 7Mesh shorts, size down. I normally wear mediums, and I size down to small with these. Highly recommended. What a great time for cycling clothing! These days, a jacket is not just a jacket and a jersey is not just a jersey. Gone are the days of constantly stopping to peel of your shell jacket to prevent overheating. 7Mesh copy says “The comfort of a jersey with the protection of a jacket. The ultimate performance softshell for high-intensity riding in cool, cold, or wet conditions.” Castelli kicked off this category with its Gabba jersey but everyone I spoke to said the Gabba was cut so tight it’s only suitable for racing. The Corsa is cut loose enough to facilitate layering underneath. I’ve had great results with a short sleeve base layer on warmer days, and with a long sleeve merino base layer on colder days. The Jersey seems unfazed by foul weather. Rain beads up nicely and the Windstopper PTFE membrane keeps out the chill - while letting sweat vapors out. The Corsa is really a remarkable jersey that is at home in a wide range of conditions. We really love the “carmine” red color as well - makes me feel like Rebel Alliance from “The Force Awakens” Another win for 7Mesh. Kitsbow has created something of a wardrobe staple with the AM shorts. What makes these so essential is the fit and fabric. These shorts find that perfect fit that's right between bib shorts and baggies. I don’t want to go too deep into categories of riding: XC, trail, DH - they’re so limiting, right? I've worn them on bikepacking trips where you don’t want to roll into the small town general store in spandex. They have amazing amount of stretch due to the Schoeller fabric, which makes them both extremely comfortable and water resistant. 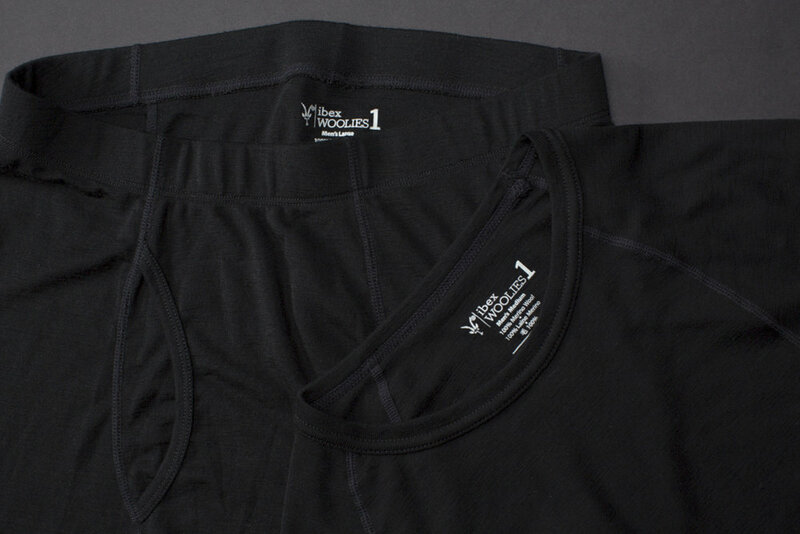 The adjustable waist is sleek and easy to use. The wicking fabric on the waistband works as it should. Kitsbow have really done their homework on these with an amazing attention to fit and detail. Treat yourself to a pair of these shorts. We’ve been amazed at the performace of these gloves. They are some of the best performing rain gloves we’ve tried. They keep the rain out and seem to breathe really well. We had a hard time overheating in them and they seem impervious to rain. The aesthetic is decidedly old school – think Andy Hampsten on the Gavia in 1988. The only negative is that the material bunches up a bit around the wrists, which isn’t perhaps as sleek as we’d like, but for performance like this, I think we can deal. Have you tried waterproof socks yet? Personally, as soon as my shoes and socks soak out, I’m mentally done. My feet start to get cold and clammy and it's over. 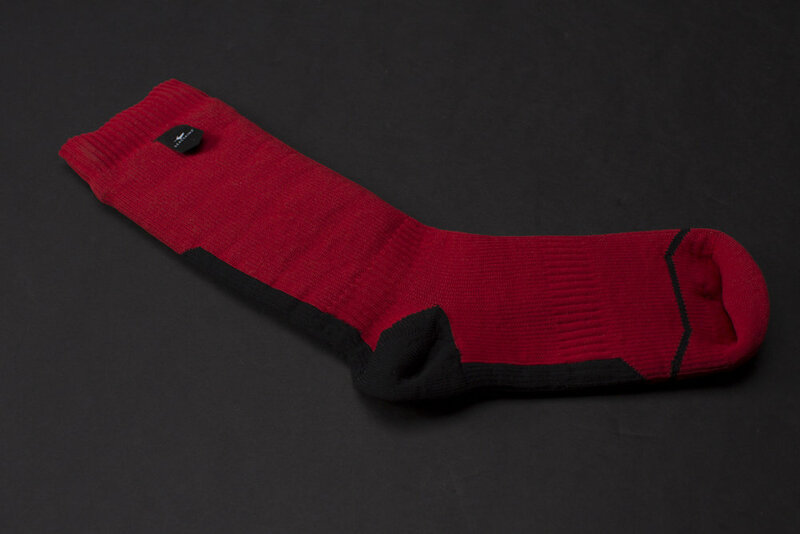 Seal Skinz socks are comprised of three layers. 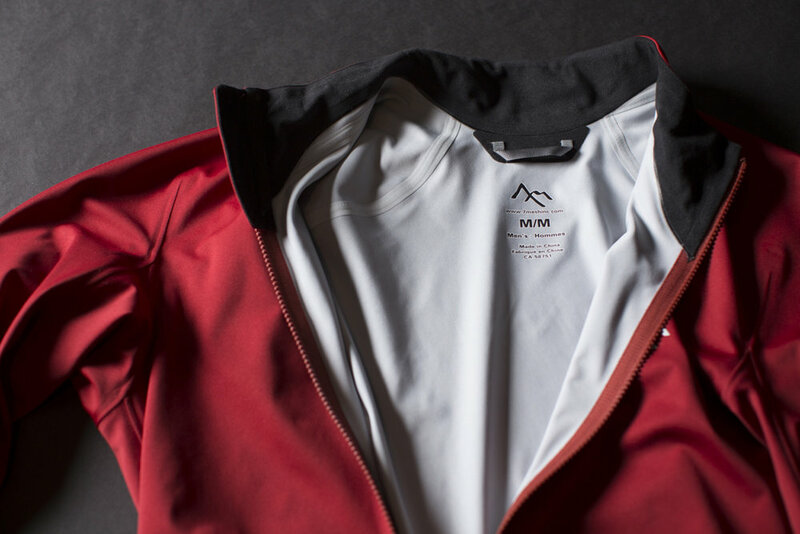 Merino/poly blend next to your skin, a waterproof/breathable membrane and a nylon/elastane outer layer. Also there is a grippy tape across the inside layer of the sock they call “hydrostop” designed to prevent water from flowing down the inside of the sock. Sealskinz makes a range of weights for different temperatures. These are a lightweight model. They are, of course a bit bulkier than normal socks, but if you have a bit of extra room in your shoes, these are worth a try. I had no problem fitting the MTB Mid socks in my Pearl Izumi X-Alp shoes and the Road Thin Mid socks in my Shimano R9 shoes. These are two of the most versatile pieces for increasing your comfort on the bike. If you don’t already own leg and arm warmers with windstopper, you should. They feel a bit on the heavy side as warmers go, but as soon as the foul weather hits, you’ll feel the protection and won’t notice them a bit. They do a great job of keeping off spray and road grime without soaking out. Very reasonably priced for how much protection they provide. This is our first introduction to POC clothing and we're impressed. Up til now, POC has just done road and “enduro” clothing. Starting in 2017, they'll be introducing their Resistance line of clothing, which will include a DH line, an Enduro line and an XC line (XC, as in Cross Country Mountain Biking) The fit of this jersey is great. It's slim cut, without being clingy and skin tight. The length of the sleeves is perfect, the collar comes up high on your neck in a very comfortable way. The jersey also sits very clean at the hem, it snugs up against your shorts and stays put. Two more noteworthy things - the weight is nice, it's good for 50 and 60 degree days, and has good breathability and mesh down the back where you'd want it. Also, the tear resistant cordura fabric on the shoulders and arms seems like it will do it's job (luckily we haven't had to test that aspect) Finally, pockets. Four of them. The capacity isn't huge, but it's good. The fourth pocket is centered and allows you to stash one larger item, like a jacket between the center pocket and the body of the jersey. Someone put some a lot of thought into this jersey. It's a versatile jersey that will work great in many situations from MTB to gravel rides. Miir is a new Seattle brand that makes beautiful and useful things. They make bikes, bags, insulated mugs and tumblers. They give 5 percent of profits to trackable giving projects. From the Miir website: “The MiiR Give has contributed to 55+ water projects in Southeast Asia and Sub-Saharan Africa of various types including biosand filters, construction and rehabilitation of water systems and supporting hygiene and sanitation programs.” We’ve been loving their insulated mugs and travel tumblers. The 16 oz. tumbler is the perfect vessel for hot tea and travels well if/when you go by car. They’re nice to look at too. We noticed the insulated mugs at Trans Cascadia this year as the official event mug. So, I'm guessing if you're looking for a insulated mug for your next event, that might work out nicely. The newest addition to SteriPen’s lineup is the Pure + and it’s the smallest and lightest purifier they’ve made so far. It treats a half liter of water in 48 seconds and it weighs only 2.6 ounces. It fits easily in a jersey pocket and it will give you about 40 treatments per charge (did we mention it’s USB chargeable?) So, if you like to just put your water bottle under a flowing waterfall to fill up, this may be the unit for you. No reason to leave home without it on those all day rides to the middle of nowhere. We take our hydration and recovery pretty seriously, so when OSMO disappeared from the marketplace I had to go back to the source. The source for me, is Dr. Stacy Sims, who is an expert on hydration for sport and was the creator of the OSMO formula. I still can’t tell you what happened to OSMO, but I can tell you that NBS is a Stacy Sims formula and it works. Clifton Duhon founded Breakthrough Nutrition with the idea to bring high quality hydration and recovery formulas to the public at a (much) more affordable price point. NBS stands for No B.S. hydration, and that means no fancy marketing or packaging, but instead you get 40 servings for $15, (Skratch costs $19.50 for 20 servings) 80 servings for $25 or 100 servings for $29. The hydration formula is subtle and easy to drink. We like the Lemon and Pineapple flavors a lot. They have two different formulas for men and for women. They also do a 40-serving preload formula for $28. We’ve relied on preload for hot rides like the Stampede with great results. It seems identical to OSMO preload, The bicarbonate is pretty salty and not delicious, so you know it’s effective. Their 20 serving recovery formula is $39. The formula is high quality whey protein, casein, and sucrose with organic vanilla. We're grateful to have high quality hydration and recovery protein at a great price! Part of Ortlieb’s High Visibility line, they call this a Large saddle bag, (2.7 liter capacity) it makes a great mid-capacity seat bag. Their bikepacking bags are much larger. The same great material as the Velocity bag, with reflective yarns gives the bag high visibility and waterproofness. The size is perfect for a bit of extra kit for a road or gravel ride – enough room for spare gloves, extra leg warmers and a jacket. (I also discovered recently that my DSLR fits nicely inside with room for a jacket and rain pants.) Once the mount is installed on the saddle rails, it’s easy to slide the bag onto the mount and remove after a ride. My only complaint is the six large bolts inside the bag, which seem obtrusive if you’re used to bikepacking seat bags. Recommended. Ortlieb packs have become standard equipment for messengers for the very simple reason that they work. They hold a good amount of stuff, they last forever, and they’re weatherproof. Now the Hi Vis line takes those excellent qualities and adds visibility – The reflective yarns that are woven throughout the bags surface light up in car headlights. With the waning daylight and increase in distracted driving, this is huge. 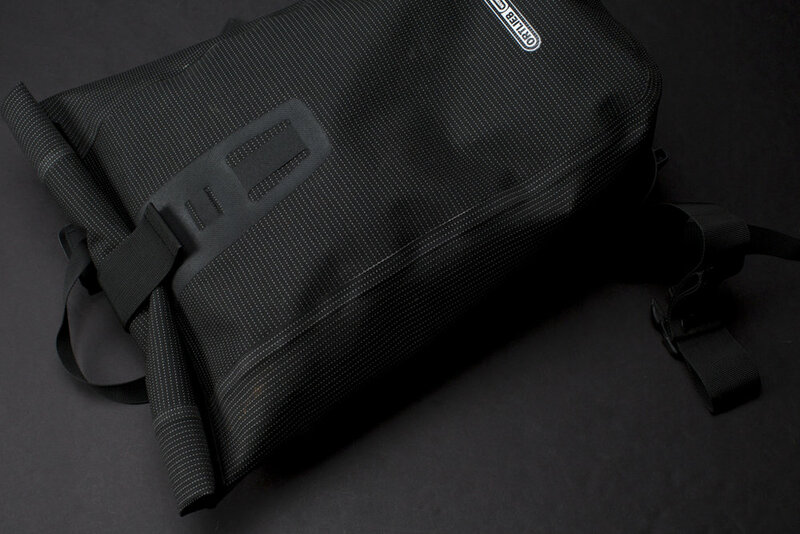 Waterproof – This bag, with its rolltop closure and polyurethane coated cordura is truly waterproof. No need for a separate bag cover - the bag really sheds grime and rain. Weight is very reasonable. The 20 oz. bag comes in at 33.5 oz., Our only complaint is that the hardware is a bit large and clumsy and the waist strap is a bit oversized and seems to get in the way if not in use. Ortlieb have designed all the parts to be modular and replaceable, so that could explain the chunky hardware. Still, all things considered, this is a great bag. Also worth mentioning: The bags come with a 5-year warranty! While Exposure lights are not the cheapest, they are some of the best and most versatile lights. The reason we chose the Diablo from their lineup is light weight and ease of use. An elastic band and a plastic clip that holds the light securely works well on handlebars and a separate plastic helmet mount that installs easily with an allen wrench and stays put. For trail riding, we put a 1800 lumen light on the handlebars and supplement with the Diablo as a helmet mounted light. The way we see it, any money spent on additional lights is money well spent. A brighter light, whether used for daily commuting or bikepacking extends your comfort zone – letting you ride longer and safer. The Diablo is USB-chargeable – a full charge takes 3 hours and at full strength (1400 lumens) run time is one hour. Keeping the light on the low setting extends the run time to 24 hours! It takes a bit of learning to know what the blinking lights on the back of the light mean – green until at 70%, amber until 40% red until 25%, red pulse til 10% red flash. A great light and well worth the price. We love our Knog lights! They go with us on every ride these days, day or night. Anything you can do to make yourself more visible when commuting is worth it. We love the elastic bands - they fit easily on handlebars or seat posts. The previous generation of the Knog lights didn't have removable elastic bands the way these do. This is a huge improvement! They're light weight and USB chargeable. Get the white one for your bars and the red blinky for your seatpost and keep them charged. Go ride and be visible! I don't think it would be a stretch to call the POC Octal helmet a modern design icon. It doesn't look like any other helmet in the market. You'll never confuse it for a Catlike or a Lazer. Next year POC will introduce the Octal X, which is designed to be a XC mountain bike helmet. For crash resistance, POC has added its Aramid Bridge Technology, which is designed to spread impact forces. Weight for the M-L size is a feathery 210 grams. Ventilation is great, it's easy to adjust, helmet straps cinch down without twisting. Also worth mentioning is the RECCO reflector, which is used to find avalanche victims in ski resorts and can also be tracked from helicopters. I'm still not clear how much RECCO detectors are being used in the backcountry. It may be more common in Europe. All in all, a very good looking and user-friendly helmet. First lets talk about the Strada LGG. 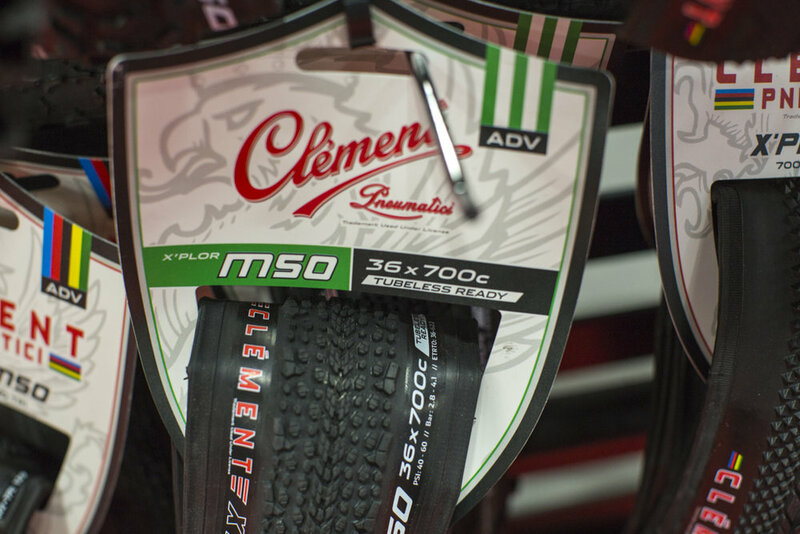 If you’ve been following Clement, you know that they name all their tires for airport codes, so LGG is Liege, Belgium home of the legendary spring classics race, Liège–Bastogne–Liège. This is a premium tire, so you get 120 threads per inch and a dual compound tread. The tire has a chevron pattern that is designed to give good grip in wet or dry conditions. We ride tested the (non-tubeless) standard folding bead clincher model all summer long on a huge variety of surfaces and literally had only one flat due to a staple. The big news with this tire was the release of a 32c tire and the latest iteration is a tubeless version of that 32c size. We were able to hang on fast paved group rides as well as all day dirt road rambles. That’s the kind of versatility we’re looking for! We love the Strada LGG. Recommended. For dedicated day-long gravel epics, we mounted up the X’Plor MSO. MSO is the airport code for Missoula, Montana. The tires are designed with smooth-rolling center knobs, so I’m sure these ride well for pavement as well, but I saved them for the chunky days where I knew I needed more traction. We rode the 120 tpi clincher version on rides like the Stampede and we couldn’t have asked for a better performer. It rides fast and inspires confidence. They mounted up easily and I can honestly say I had zero problems. We can't wait to test the 36c tubeless version! 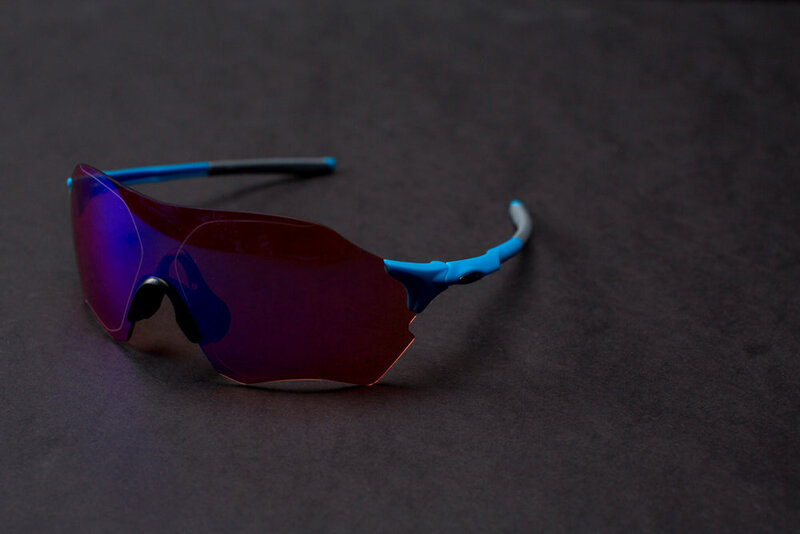 Nino Schurter wore these to win gold in the Rio Olympics XC mountain biking race. Enough said, right? Nino is the boss. If you haven’t tried Prizm Trail lenses yet, you should. Improving your vision on trail will only increase your confidence and help you to pick out detail as you scan the trail for lines. We miss the adjustability of the arm length in the Jawbreaker, but the story with these is minimal weight for glasses that practically disappear on your face. Weight weenies rejoice!